Two weeks ago, I wrote a column for a local publication on how to be a tourist in your hometown. Taking my own advice — and literally going the extra mile — I drove across town to Berkley, the city next door, and made a new discovery. 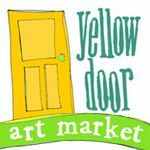 Located on 12 Mile Road, the Yellow Door Art Market showcases the wares of more than 60 top-notch Michigan artists and crafters. From gift cards to jewelry to fiber art, there’s something to delight everyone at this colorful emporium. In fact, next time I need a gift, I’m heading straight for the Yellow Door.